While the Ontario Hockey League is dominantly filled with Canadian-born talent, it has also helped produce incredible American-born players, too. Skaters like Alex DeBrincat (Chicago Blackhawks), Bobby Ryan (Ottawa Senators) and Ryan Callahan (Tampa Bay Lightning) all came from the OHL. Did you know that the all-time points leader in the OHL is also American? Stan Drulia put up 479 points in five seasons with the Belleville Bulls, Hamilton Steelhawks and Niagara Falls Thunder. This record has stood since 1989. 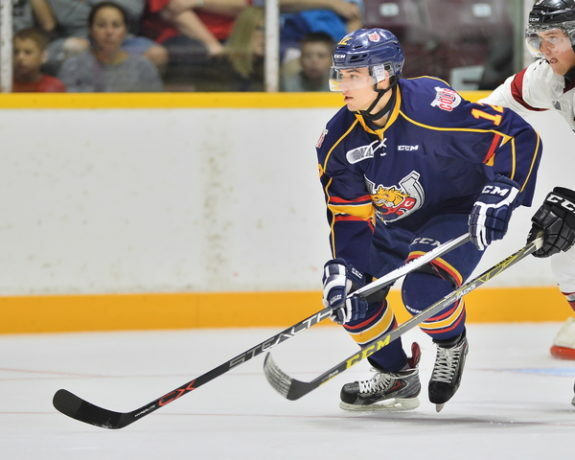 The Barrie Colts have lent a helping hand developing American players over the years. Some have come through the Colts’ system and had a positive impact on the team. While not all have made it pro, some have gone on to play in the NHL. Here is a look at the top-three American-born Colts in the franchise’s history. There might not be a more controversial addition to this list than Brendan Lemieux. Son of four-time Stanley Cup Champion Claude Lemieux, Brendan played a similar style to his father. To add to the controversy, he was born in Denver but represented Canada at the 2013-14 Hlinka Gretzky Cup. Lemieux was drafted by Barrie 69th overall in 2011. He joined the Colts in 2012-13 after starting the season with the Green Bay Gamblers of the USHL. Playing in 42 games as a rookie, he put up 6 goals and 8 assists. He played the majority of his OHL career in Barrie before getting traded to the Windsor Spitfires in his final season. During his time with the Colts, he scored 83 goals and 58 assists in 175 games. Only BJ Crombeen scored more goals as an American-born Colt with 86. However, Crombeen played in 73 more games than Lemieux did with Barrie. The Buffalo Sabres drafted Lemieux in the second round in 2014. The Sabres traded him to the Winnipeg Jets in a deal that saw Evander Kane go to Buffalo in 2015. While Lemieux is a player you generally either love or hate, he is without question one of the best goal scorers in Colts history. His slap shot was, and is, about as nasty as his attitude on the ice. Though he struggled with discipline, he always stood up for teammates and had the ability to get into opponents’ heads. He was dominant on the power play and was always hard to play against. 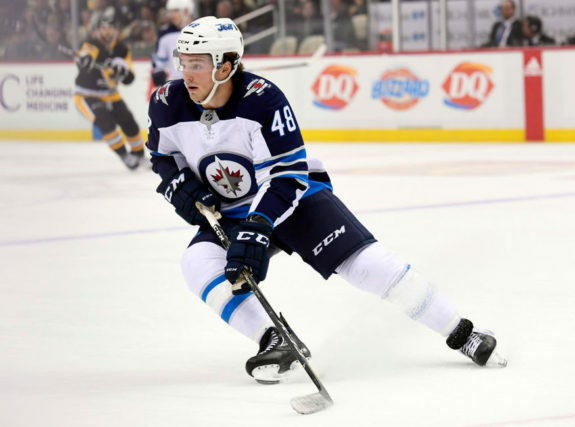 Expect him to grow into a greater role with the Jets now that he seems to have solidified a role and hasn’t been sent to the AHL this season. Erik Reitz might not be a name that jumps out at you based on point production, but he was a huge piece for the Colts from 1999 to 2002. Barrie drafted him 19th overall at the 1999 OHL draft. The Detroit-born defenceman played his rookie campaign the following season when the Colts won the J. Ross Robertson Cup for the first and only time in team history. He put up two goals and 12 assists that season and was named to the CHL Memorial Cup All-Star team. Reitz was a physical player who shut down opponents. Through three seasons, he played 192 games and scored 20 goals and 58 assists. His final season with Barrie was in 2001-02 when he was named Colts captain. He won the Max Kaminsky Trophy (OHL’s most outstanding defenceman) and became the only Colts player to represent Team USA at the World Junior Championship. The Minnesota Wild used a sixth round pick on him at the 2000 Entry Draft. He spent most of his pro career in the AHL before heading to the KHL. Reitz finished off his career by winning the EBEL Championship with EC Salzburg in 2011-12 before he retired. While ranking players can be subjective, I don’t think you would hear many arguments against Kevin Labanc topping this list. In fact, you could even make the argument that he is one of the top players in team history. Kevin Labanc of the Barrie Colts. Photo by Terry Wilson / OHL Images. Drafted by the Colts in the sixth round in 2011, Labanc played three seasons with Barrie. He posted more than 100 points in each of his final two seasons with the team. The Brooklyn, New York native played 198 regular season games and put up 81 goals and 188 assists. His 269 career points are fourth-most in team history, while his 188 assists are third-most. It is worth noting that Bryan Little and Daniel Tkaczuk are the only Colts with more assists. Both have 189 but played at least 40 more games in their careers compared to Labanc who averaged .949 assists-per-game. The 2015-16 season was his over-age season with the Colts and was his best campaign. He posted 88 assists, still a team record for a season, and led the OHL with a plus-60 plus/minus. Labanc took home hardware that season by winning the Eddie Powers Trophy (most points in the OHL with 127) and the Leo Lalonde Trophy as OHL overage player of the year. Labanc was such a fun player to watch. Strong playing five-on-five and dangerous on the power play. He is a fast player with a dangerous shot, great vision and precise passing ability. All these attributes led to him being drafted by the San Jose Sharks in the sixth round at the 2014 Entry Draft. In a little more than two seasons, he is fitting in well with the Sharks and looks like he will be one of their top stars of the future. He has played in 170 NHL games, putting up 20 goals and 60 assists in them. 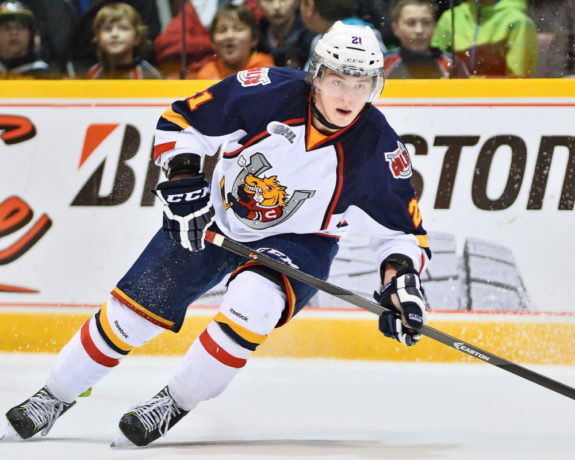 Joey Keane could earn a spot on the top-three list as he still plays with the Colts. The New York Rangers prospect has tallied 17 goals and 66 assists in 158 games. If he remains with the Colts, he could find his way up higher on this list in the future. Vladimir Nikiforov ranks third in team points among Americans with 159 points. He scored 59 goals and 100 assists through 164 games with Barrie. BJ Crombeen played 248 games with the Colts, most all-time among American-born players. He scored 86 goals in that span, seventh-most goals in team history. He also added 84 assists for 170 points. Labanc is the only American in team history with more points.